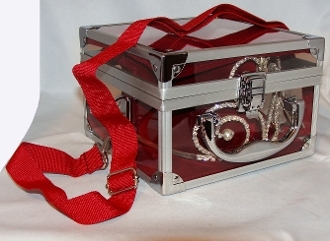 Tiara and Crown Case -Burgundy Interior with Shoulder Strap. one of a kind, no one will have another like it. Turn heads with this elegant, yet practical carrying case for your beautiful crown. Just put it over your shoulder and free up your hands! Adjustable shoulder strap length from 27" - 54"